The Trade Engagement Programme for India (TEPI) in Australia’s state of Victoria has announced a “super” trade mission involving more than 100 organisations. The mission will visit India from 11-15 March to develop and strengthen business ties with the subcontinent. “The mission will include sectors of strategic importance to Victoria and India including: automotive, aviation and aerospace, biotech, ‘cleantech’, education, food and beverage, ICT, infrastructure and tourism,” a TEPI statement said. The 2013 mission follows in the footsteps of a similar initiative last year that generated anticipated additional sales of over $355 million, according to the TEPI website. The programme also comes during renewed Australian leaning toward Asia as a significant trading partner. According to the Australia in the Asian Century report, commissioned by Prime Minister Julia Gillard’s government. “the pace and scale of Asia’s rise has been nothing short of staggering”. This has largely been behind what some analysts are calling Australia’s Asia “pivot”. Demand for Australian commodities surged in the past decade as China and India continued to enjoy economic emergence. “China is a relatively small but growing market for Australian coal and natural gas. 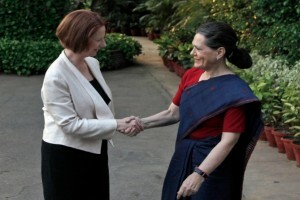 India, on the other hand, is the second biggest importer of Australian coking coal (behind Japan),” the report says.